He kept them in the pool in back of his mansion. 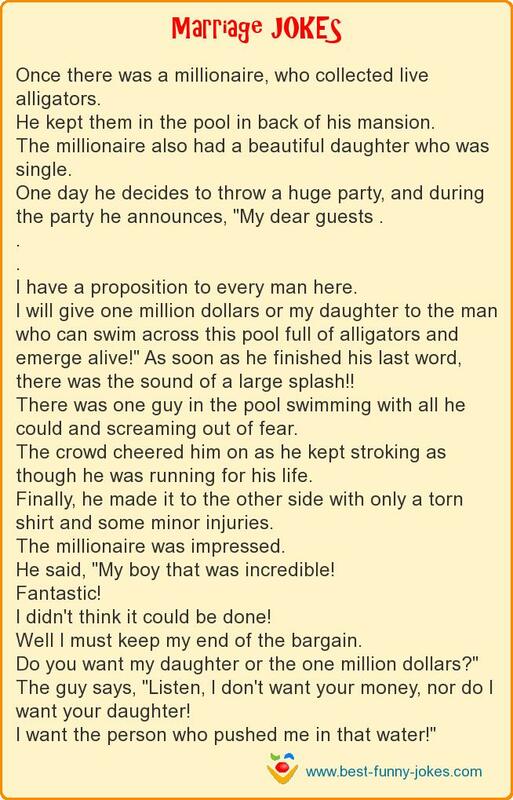 The millionaire also had a beautiful daughter who was single. One day he decides to throw a huge party, and during the party he announces, "My dear guests . I have a proposition to every man here. I will give one million dollars or my daughter to the man who can swim across this pool full of alligators and emerge alive!" As soon as he finished his last word, there was the sound of a large splash!! There was one guy in the pool swimming with all he could and screaming out of fear. The crowd cheered him on as he kept stroking as though he was running for his life. Finally, he made it to the other side with only a torn shirt and some minor injuries. He said, "My boy that was incredible! I didn't think it could be done! Well I must keep my end of the bargain. Do you want my daughter or the one million dollars?" The guy says, "Listen, I don't want your money, nor do I want your daughter! I want the person who pushed me in that water!"